Some years ago, the Pillsbury television ad said, "...nothin says lovin’ like something from the oven." Although the ad ran during the volatile 60s, it became an immediate favorite. After all, who doesn’t love fragrant aromas wafting from their oven? I enjoy my kitchen and showed my love for family when I turned out savory foods and baked good especially for them. 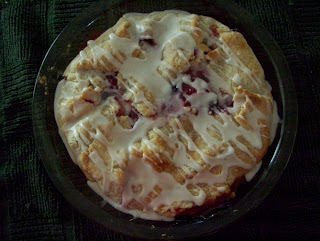 I thought of wonderful family times as I put the recipe for Quadruple Berry, Apple-Rhubarb Pie together. My inspitration came from a Schwan's pie which was actually a triple-berry apple-rhubarb pie - it was one of the best pies I had ever tasted with its wonderful crust, sweet fruity interior and an sweet vanilla icing. 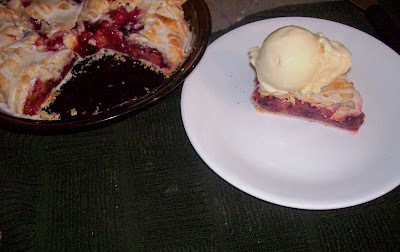 I added a fourth-type of berry and my crust was folded. A two-crust recipe allows for two pies to be made, if desired. (The pie filling recipe may be cut in half and the crust may be formed like a traditional two-crust pie to make one pie). Preheat oven to 425 degrees. In a large bowl, combine granulated sugar, cornstarch and flour. Add all berries, thawed apple piecs and drained rhubarb; mix well. Add orange juice and mix well. Roll out half pastry for each pie. Place rolled dough in 2-pie plates. The dough should hang off plate edges. Place half of the filling in each plate. Dot with butter. Bring up edges of dough and gently lay onto the top of the filling toward the center. Bake until fruit is tender and crust is browned (about 50 minutes). If crust is browning too much, lay a piece of foil on top for the remainder of the baking time. Remove finished pies to cooling racks.